An elegant, yet cheap beach wedding ceremony! As you can see, our cheap Florida beach weddings include everything you need for your dream wedding ceremony. Get everything you need at a price that you can’t beat. We love the simplicity this package provides, and by keeping the guest count low you can assure that you won’t break the bank. Not only are you looking to escape the stress of a wedding back home, but you are looking to save money and still have an unforgettable experience. 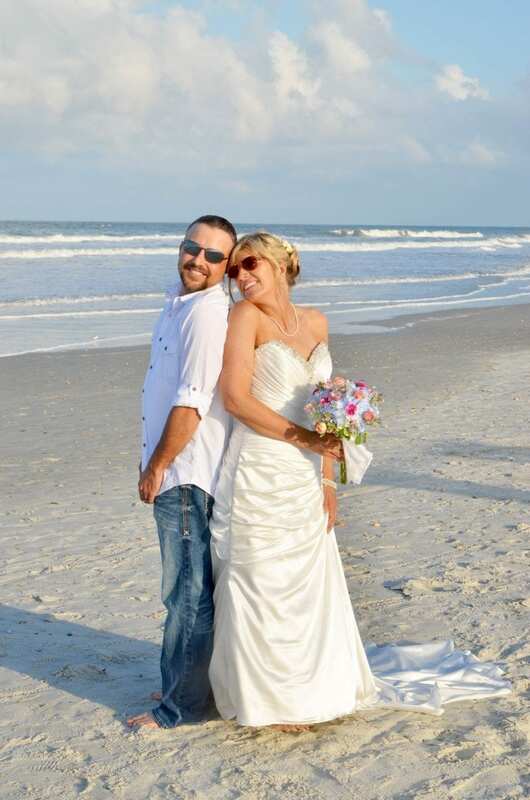 Our Cheap Florida Beach Weddings will give you your dream come true without breaking the bank. Included in the price of our package is an officiant, ceremony photographer, set-up and break down of our decor, a ceremony coordinator and all of the decorations. Just because you want a cheap Florida beach wedding, doesn’t mean you should have to compromise on decor. Our Beach Beginnings Package is ideal for you. With up to 25 people, including the bride, groom and bridal party, you can have a complete and elegant destination wedding at a price you can afford. Don’t let the word cheap scare you, our cheap Florida beach weddings are anything but cheap when it comes to looks! We use real, natural bamboo poles, and beautiful greenery in this set-up. Our music will be played clearly on our AMP, and your photos will be “brag-worthy” back home!